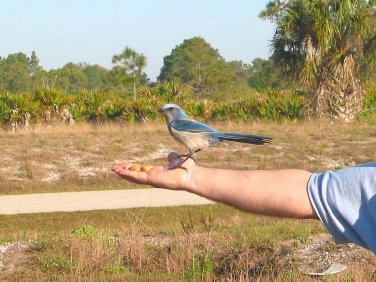 A recent BBC nature bird article, reporting the results of a Californian study into the behaviour of Western Scrub-jays, reminded me of my own fabulous experience some years ago with their close relative the Florida Scrub-jay. The study found that on coming across a dead bird the Eastern Scrub-jays would recognise this as ‘bad news’ and react by ceasing to forage, gathering around it and calling out warnings to other birds. This behaviour might continue for a day during which time the birds would not eat. The full report can be see in the journal “Animal Behaviour”. To me this sounds like a survival strategy requiring a degree of intelligence. My bizarre experience in Florida with their Eastern relative also suggested these jays are intelligent birds and capable of adapting in order to enhance their survival chances. 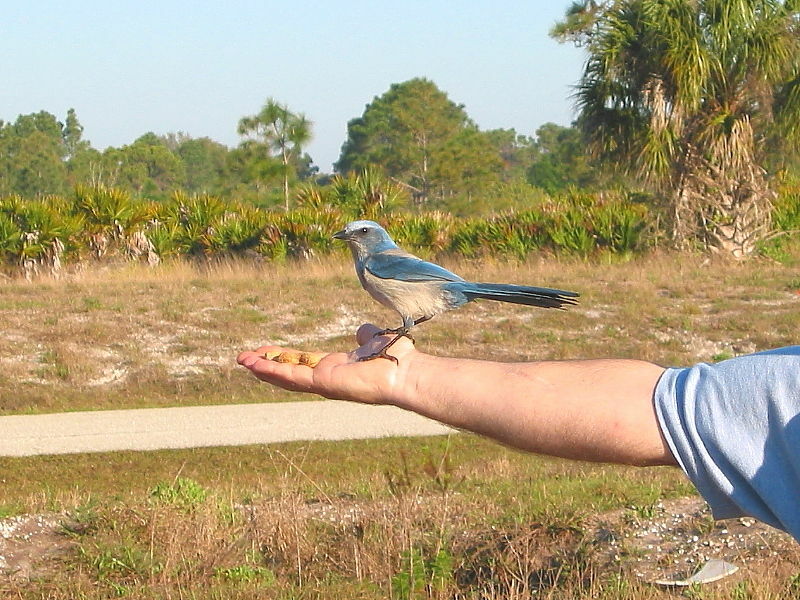 I was doing an early morning walk scanning some scrub for birds when I watched in disbelief as a Florida scrub-Jay flew out of a tree in front of me and over to the road where it landed on a walkers outstretched hand. Through the bins I watched it filling its beak with peanuts from the lady’s hand before flying off back into the scrub. It was the first Florida Scrub-jay we’d seen and to watch this was simply too great an opportunity to miss. The next morning saw me standing in the scrub with my peanut filled hand held out. And sure enough within minutes — the photograph says it all.